We recently joined a list of global attractions available for exploration through Google Arts & Culture’s Museum View experience. Visitors can now move through our permanent galleries at the click of a button and enjoy a private view of around 20,000 objects on display. The Digital Media Team here at National Museums Scotland led delivery of the project so I’ve captured some of the lessons we learned to help others understand what’s involved in creating a Google Museum View. Google Arts & Culture partners with institutions around the world to make cultural and historical material accessible online, and the partnership helps us at National Museums Scotland achieve our mission to make our collections accessible to as many people as possible. Captured in September and October 2016, and launched in March 2018, the Museum View is the latest in this partnership and follows on from key stories published through the platform including Scotland’s Early Silver, Jean Muir: a Fashion Icon and Centuries of Style. How do you create a Museum View? The Museum interiors were photographed over two shoots using a Google StreetView trolley camera, with the capture being led by Google’s own 360 photography specialist, Sergio. Google employ a team of photographers who have the enviable job of visiting and capturing many hundreds of cultural sites around the world, so snooping around the Museum after dark was perhaps more exciting for us than him! Google’s photographer uses the trolley camera to capture the Grand Gallery. 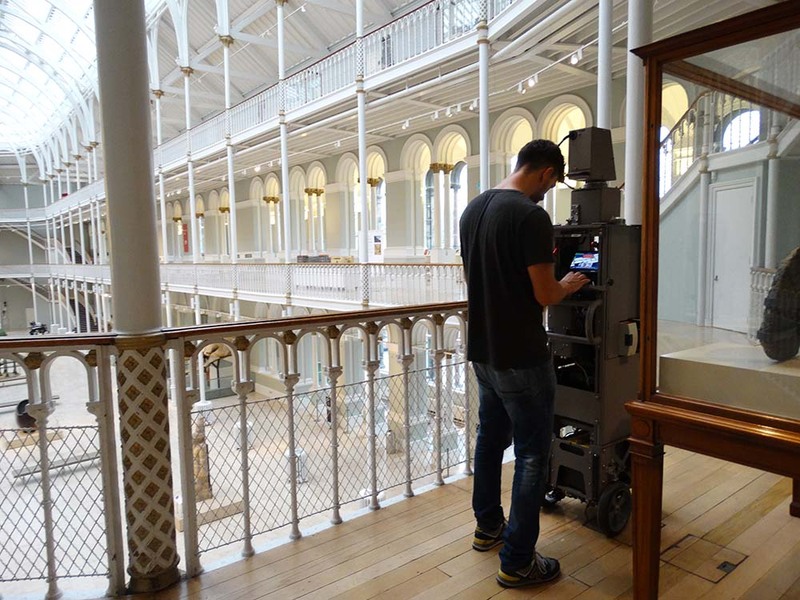 The task itself involved pushing the trolley camera along each level inside the Museum and stopping every few metres to capture high-resolution sequential 360 panoramas. Initially, it was pretty exciting to be moving around the galleries shooting after hours, but it quickly became a monotonous process of capture, move, capture, move, capture, move for hours at a time. The images were then uploaded to the Google StreetView platform where they were stitched together using GPS data. Then it was up to the Digital Media and Collections Information teams to complete the (not insignificant) editing and approval process. From logistics, access and capture, to editing, blurring and approvals, the entire process took around a year and a half to complete. Part of Google’s requirements involve providing after-hours Museum access to ensure no staff or visitors appeared in shot. Arranging access both before opening and after closing involved collaboration across various museum teams, from security and visitor experience staff to curators and collections specialists. There was so much to capture in a short time that the shoot was planned like a full-scale media production complete with call sheets, gallery capture schedules and a rotating cast of photographer chaperones. Some of the shoots ran on late into the night, so we had to make sure staff were briefed and in place to assist. The shoot also had to take place at a time when the Museum wasn’t in use for hospitality too, which meant detailed planning to ensure the galleries wouldn’t be filled with revelers at one of the Museum’s many evening events. The pay-off is that the Museum View has an exclusive behind-the-scenes feel as visitors have the Museum all to themselves. The challenge with intellectual property rights was a big one. Many objects on display are taken from our permanent collections, meaning we retain the rights to interpret and publish these items across platforms. However, for many loans, contemporary objects and images used in displays, original agreements hadn’t included permission to publish online which provided a challenge. Thankfully our Collections Information team agreed to tackle the huge task of identifying and approaching lenders to seek permission where necessary, which meant we could publish around 80% of the entire Museum online, which makes for a rich and engaging experience. The project allowed us to re-think how we secure permissions as part of loans and licensing agreements which will make similar digital projects much easier in future. Top tip – when licensing images always try to include online publishing rights from the outset, as it’ll help avoid difficulties later on. 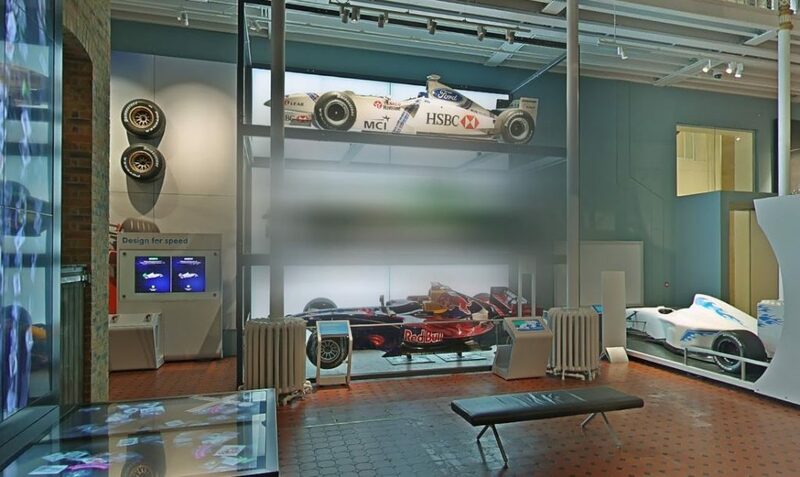 As you click around the Museum, you may notice the handful of objects and panels which are blurred from view. These are the objects and images for which permission was either withheld or where we were unable to reach the donor. The blurring process involved working with our Collections Information team to identify the physical location of a particular item, apply blurs from from various angles using the Google content management system, and proof before we could reach internal sign-off. This manual task took time and precision, but meant we could be confident in the final output (and avoid some of the issues with automatic blurring technology which can result in bizarre consequences). Some items are blurred from view due to loan agreements. Who else is using Google Museum View? The British Museum were early adopters of the of technology, launching in 2015, and the National Trust for Scotland have captured some of their countryside locations as part of the Google Trekker project (the off-road version of StreetView). Since we captured our space in 2016 the 360 capture technology has become a lot more accessible and affordable. Other museums have experimented with capturing their own images and then publishing onto the Google platform – check out Adam Koszary’s post from the Museum of English Rural Life. Even if we were capturing now I still think we would work with Google due to the sheer scale of our building. We’re continuing to develop our strategic partnership with Google and plan to publish more key objects, exhibits and stories through our Google Arts & Culture profile. We’re also working on a Google Cardboard tour of the Museum and we’re looking at ways to take the Museum into the classroom through the Google Expeditions programme. Thanks to colleagues in the Digital Media Team (Rob, Hazel, Elaine, Anita), former colleague Hugh, and Pam in our Collections Information team for long days and nights spent walking, reviewing, blurring, and testing. Take a look at the full Museum View and tell us what you think in the comments below. This is a really useful overview, particularly regarding the issue of securing online distribution rights. I don’t like it if things in a public museum are blurred – it almost ruins the experience of “being there” for me. But nonetheless, keep up the work!